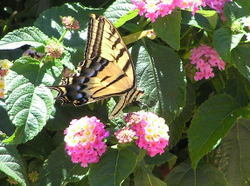 The first time I saw a lantana plant, I think in California, I was intrigued by the flowers that change color, as, I'm guessing, they are pollinated, making it easy for butterflies and others to find the goodies. But then I learned that lantana is an invasive in warm climates, and over the years I've seen its gangly shrubs growing wild in California and Hawaii. When you read this, I should be flying away too. I'll bring my laptop, but you know how that can go. I've got lots of things I'd like to write, like more in the discussion with Mark and Cernig. I've charged up my laptop with electrons and data so I can even work on the plane. I'm just going to Oregon, not as far as PLS in south Asia, but that leaves PHK as the only one at her home computer. I know she'll do a great job, and the other two of us will do what we can.